Congolese Prime Minister Antoine Gizenga submitted his resignation to president Joseph Kabila this morning. 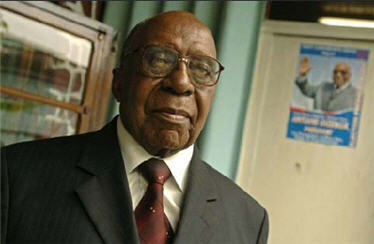 In a statement issued today on state television, Antoine Gizenga said he is now awaiting a response from the President. "We can now say that the country is getting on the right course and experiencing a dynamic of recovery and rebuilding. We must stand firm and move forward with determination. However, for every man, even if the spirit is still alert, the physical body has its limits which should be taken into account. That is why, after almost half a century of fighting for the nation, and more than 600 days of service as Prime Minister and Head of Government, I have decided today to submit my resignation to the President. I submitted the letter today at 10 AM. We will get the response from the President when it pleases him. "